i have news! happy, newly employed news. come the monday after thanksgiving, i’ll be starting as a junior copywriter at a home decor/gift store here in san francisco. let’s just say there was a lot of jumping around involved after i received the offer and i may have let out a pretty sizable squeak… but honestly, after too many months of marinating in pajamas peppered by too few freelance gigs, it’s all rose-colored contacts and giggles over here. then i looked in my closet, and a minor freak-out ensued. you see, i’ve never actually had to “dress” for a job. four years (give or take) of working for various fashion and retail-focused start-ups has left me with lots of wiggle room, wardrobe-wise… which is totally fine until you end up with a job where styles err on the side of corporate. in a nutshell, my closet is a place where flirty dresses, v-neck tees and boyfriend jeans hang out (heh) with enough little, medium and big brown bags to make my credit cards shudder in their worn leather sleeves. my trusty theory suit cowers in a corner, outnumbered by an army of casual attire. basically, i’m starting from scratch here. i went to zara yesterday, tried on as much of the store as i could fit into one of their teensy dressing rooms… and walked out with a skirt. one skirt. 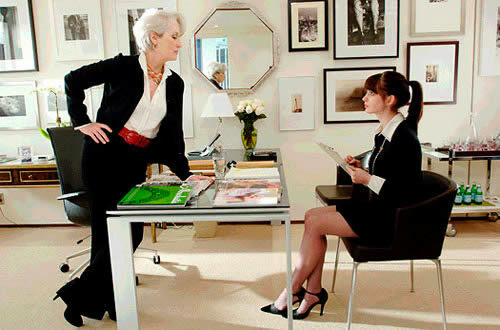 question: what are your work outfit essentials? do you like to have fun with work outfits? any help/inspiration is much appreciated! Honestly, until you really know their dress code, I wouldn’t spend too much on a new wardrobe. Get the staples – a pair of black pants, a black skirt, some nice button down tops (maybe a few belts/waist belts to spice things up) and accessories. After you see how people dress, you can go on a shopping spree your first weekend on the job! thanks! 🙂 i like this approach. Hi Lisanne, Congrats on the new job!!! I’m sure you’ll be great at it! I had to redo my wardrobe because of school. My closet changed from a mini Forever 21 to Ann Taylor Loft. Also, may I suggest wedges. They are cute and very comfortable. thanks Anna!! i just ordered wedges from anthropologie actually! i miss shopping with you 🙂 hope school is going well! You are currently reading working girl at hello lisanne.